At ShopLinen.co.uk, we offer top quality duvet covers, from globally respected brands like Sheridan, Christy, Dorma, Helena Springfield, Bedeck and many more. We offer one of the most extensive ranges of duvet covers online, including 100 percent cotton or polycotton bed linen. Certain duvet covers come with matching pillowcases, for maximum simplicity, while others are sold separately, leaving you free to purchase different pillow cases that will add an interesting, personal touch to your bed. Please be sure to order your pillowcases where necessary, in order to save on shipping costs. 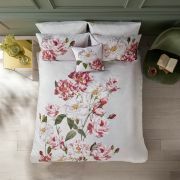 ShopLinens.co.uk offers some of the most stylish duvet covers inIreland including beautiful, delicate, floral ornate options, perfect for creating the traditional look. We also offer classic damask fabric designs, which are rich, opulent and timeless. Our children’s bedlinen ranges are among our most popular products online, and the Helena Springfield Farmyard range, especially so. Making the transition from cot to a 'big child's bed' is fun and easy for your little one with our wonderful and exciting range of kid’s bed linen. What separates ShopLinens.co.uk from our competition is our extensive range, and our children’s bed linen is no exception. We offer single and double bed alternatives, both at highly competitive prices. Don’t forget to check out our selection of matching curtains, cushions and throws that will finish off the look of your child’s room perfectly. All of our children’s bed linen is sold as sets, so pillowcases are included.